It’s time to get promoted. Move up higher. Get committed. Quit fooling around! After all, eternity is at stake…. I was not raised in a religious home so I wasn’t familiar with the traditions surrounding Easter. The church I went to for 23 years after I became born again only celebrated Good Friday and Resurrection Sunday. I wondered if there was more to remember during Holy Week, or Passion Week, as it is sometimes called. I wanted to know if perhaps there was a remembrance for every day of the week before Easter. There was. What I learned may cause you to want to know Jesus better, draw closer to him and appreciate his sacrifice much more, maybe even prompting you to take his call on your life a lot more seriously. Passion Week starts on Palm Sunday, the Sunday before Easter, the day when Jesus made his Triumphal Entry into Jerusalem as a conquering King, not of this world, but over sin and death. The masses waved palm branches in celebration because the palm branch was a symbol of triumph and victory in pre-Christian times. The Romans rewarded champions of the games and celebrated military successes with palm branches. Palm branches were also a symbol of Jewish national pride. This was a patriotic rally where the people gathered to welcome Jesus. We would be waving American flags if this took place in America today and if Jesus were returning as a war hero. The crowds looked to Jesus as a political and national savior, but missed the fact that he was a spiritual Savior. Then there’s Holy Tuesday. This was when Jesus challenged the religious leaders of his day and pronounced his eight woes to them, essentially telling them that they were hypocrites and headed for Hell. (If you must act out, start first with those on Christian television.) He also praised a widow who put all she had into the offering plate and in the evening talked about what was going to happen in the last days. The fourth day of Passion Week is called Spy Wednesday, the day Judas betrayed Jesus to the authorities. Of course, Good Friday is when our Lord was crucified. Why is it good? Certainly what the Roman and Jewish authorities did to Jesus was not good. It’s good that Jesus died for the sins of the world. “But God demonstrates his own love for us in this: While we were still sinners, Christ died for us.” His last words were, “It is finished.” Sin was dealt with. 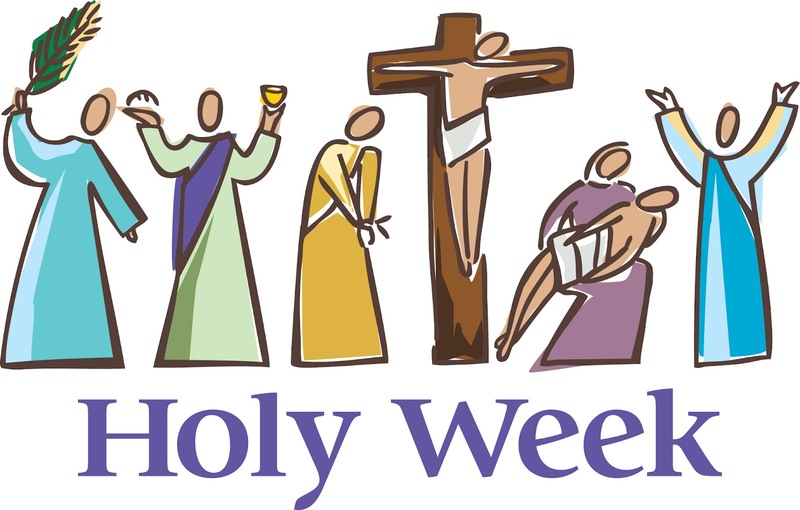 Holy Saturday is the 7th day of Holy Week, the day Jesus “rested” from his saving work. After Jesus was crucified, his body lay in the grave on Saturday. It’s remembered as a solemn day, a day to reflect on life without hope, life without Jesus’ resurrection from the dead. Do you have hope or are you trusting in your own goodness to get you to Heaven? We call it “Passion” week because “Passion” comes from the Latin word meaning “sufferings.” This was the week Christ suffered for us. It’s good to remember that he did this for us. He paid a dreadful price. With all that good news, why in the world would you only want to celebrate the Savior only two days a year? Promote thyself, C.E.O. !